A map of the Chianti region courtesy Wikipedia. We’ve all seen maps that are intentionally distorted in a way that countries’ sizes reflect, proportionally, their production or consumption of a certain product. For instance a map of Europe distorted to show per capita beer consumption might make tiny Belgium a new empire, while Italy would shrink down to the size of Slovenia in comparison. Following this logic, imagine now the size of the Chianti area in Italy relative to the rest of Italy. Going by the popularity of the eponymous wine, the use of the name in entrees (e.g. Summer Chianti Pasta) at Italian restaurants abroad, and the travel guides devoted to it, it would seem that the Chianti occupies a large relative part of the foreign imagination-ing of Italy. One would assume, then, that defining where Chianti is would be easy. Au contraire. The earliest mention of geographic zone called Chianti is in 1250; Florence has divided its territory into “leagues” for defensive purposes, and had created the “Lega del Chianti. It included Radda, Gaiole, and Castellina. This area, all inside of the province of Siena now, is relatively small compared to the zone that we know as “the Chianti” today. The league was transformed later into the province of Chianti, which was extended in 1717 by Cosimo III de’ Medici up to (but not including the municipalities of Greve and Panzano). Chianti ceased to exist as an administrative district, however, when Grand Duke Pietro Leopoldo divided the territory up in municipalities in 1774. 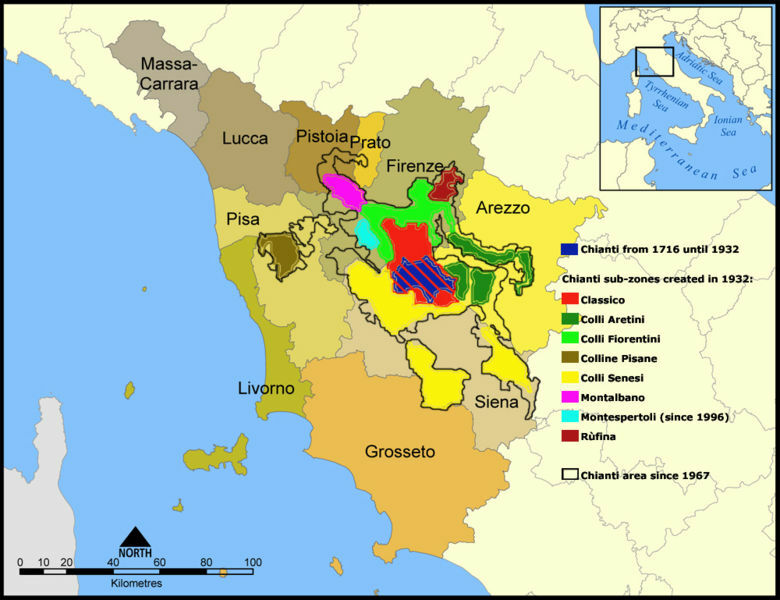 A map of the Chianti region divided by DOC wine production zones, courtesy Wikipedia. For some reason that may have to do with a worn-out rubber gasket on my moka, my coffee was particularly bitter this morning. The obvious decision was to add a little sugar, which I carefully poured directly from the box. Usually we fill a small sugar dispenser but it wasn’t handy; this meant that for the first time I noticed the words on the sugar box: “Zucchero Terre Antiche” [Sugar Ancient Lands]. This was the name of the sugar and the producer, I discovered. The box had a simple design, with a map of central Italy on it with the names of the cities on it. In Latin. Florentia, Saena, Perusia, Assisium, Arretium. It seemed like an attempt at connecting this sugar in some vague culinary way to Roman times, a gimmick that is par for the course here in Italy for just about any tradition. The box’s “subtitle,” Dolce storia quotidiana, (Sweet daily history) suggested the same. Sidney Mintz, the authority on the subject of sugar, says that while likely known to Romans of the first century c.e., “[t]he Arab expansion westward marked a turning point in the European experience of sugar.” A peek at the company’s website made their intentions a little less murky: they gave a decent thumbnail sketch of the history of making sugar from sugar beets, then linked to this to their production facilities, all in the “ancient lands” of central Italy. I couldn’t decide what importance to give to this, but they made explicit, both on their box and on their site, that they did not use GMO sugar beets, but rather varieties developed in Central Italy. 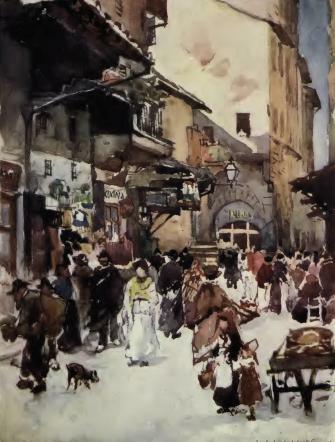 The following was written 1884 in a vist by an Englishman mere months before Florence’s Old Market (that dated back to Roman times) was demolished. The fish market presents equally curious specimens of food. The sepia, or cuttle fish, is much liked, and you see its long arms, with their curious rows of circular disks, lying about in all directions. You will never find a mackerel; and if a salmon be visible, it has been imported for the benefit of some English Midas, at ten francs the Tuscan pound of twelve ounces. But there are large-headed, three-sided fish called naselli, which are as good as whiting, and a large kind of cod called palombo. Lobsters, as we know them, do not appear, but there are huge crawfish, larger than any lobster, and looking like magnified shrimps. It is a fashion to fry the very small shrimps in their shells, and eat them crisp and entire. Frogs’ legs also make a very delicate dish of fritto. Indeed, what will not an Italian make delicious in a fry? A dish of dainty morsels, fried in butter, of a pale brown, is placed before you, and its contents will prove a perfect riddle. Probably there will be melon flowers, bits of every vegetable imaginable, celery, morsels of calves’ brain and marrow, tiny lamb chops, sweetbreads, liver, artichoke, bits of fennel, &c., &c. Nothing comes amiss to the frying-pan when fritto misto is required. But our marketing is over; we have got back to the kitchen, so we will leave the cook to her mysteries. An aphid typically called phylloxera vastatrix, the devastator, silently made a voyage from the New to the Old World and swept through Europe in the second half of the 19th century. In its trail it left shriveled, fruitless vines on desolate vineyards with confused proprietors in a region of the world that relied heavily upon wine. For the first years the phylloxera remained a misunderstood scourge and for several years afterward an unstoppable enemy. Wine production in France fell 72% in 14 years and put many small, individually owned vineyards out of business (Oxford Companion to Wine). With the combined work of entomologists, biologists, viticulture societies and governments it was overcome in Europe but remains a threat to vineyards across the world today. According again to the Oxford Companion to Wine, ‘about 85 per cent of all the world’s vineyards were estimated in 1990 to be grafted onto rootstocks presumed to be resistant to phylloxera’. The phylloxera proved difficult to understand because of its odd life cycles and its adaptable nature. The first stage hatches from eggs laid ‘in the previous autumn at the foot of the vine, where it has passed the winter, a very small insect, which travels underground to the end of the most delicate roots, and there nourishes itself by sucking the sap from the vine’ (Jemina 5). This form injects poison into the roots in order to feed on the sap of the roots and begins a colony, producing thousands of offspring. The poison injected opens a permanent canal for the insect to continually feed on the sap of the roots and prevents them from closing and healing. ‘The Phylloxera on the extremities of the roots produces a special and very characteristic kind of swelling which continues to change, or rather to rot, and the vine no longer able to nourish itself, dies’ (Jemina 7). In addition to the form of the phylloxera that feeds on roots, several other forms of the insect have adapted to serve various purposes, such as laying eggs on the underside of the leaves themselves or flying from one plant to another and reproducing. Their procreation is prodigious; botanists and entomologists estimate that millions of the aphids could be produced in one season. In this manner the tiny insects are able to multiply and consume entire vineyards, moving to the next healthy plant after its victim is depleted (Campbell 74). Early attempts at wine production in the New World by French emigrants had met with disaster. These entrepreneurs brought with them from France their grape vines of the European vitis vinifera variety which had proven to be very effective at producing wine in the Old World (Oxford Companion to Wine). For reasons unknown to them at the time, their experimental vineyards shriveled and died; climate was assumed to be the cause when, in fact, the tiny phylloxera was most likely the reason for the failures (Oxford Companion to Wine). Grape vines native to the New World were able to flourish but produced flavors and aromas that offended the European palette accustomed to the grapes produced by their own vitis vinifera. ‘Attempts to cultivate the European vines were fruitless … but Yankee character is to persevere and native vines were cultivated with great success’ (Campbell 38). Some areas of the continent were able to successfully cultivate the native vines, such as vitis labrusca, vitis aestivalis, vitis rupestris and vitis riparia, and produce wines acceptable to some Americans and a few Europeans while others, most notably California, cultivated vitis vinifera before the phylloxera made their way across the continent. During the mid-19th century there existed a strong interest in botany, especially in upper-class Victorian England. During the 1850s and 1860s, an American vine called the Isabella proved to be very popular as ornamental decoration in gardens and was shipped en masse into Europe from the United States (Campbell 25). Grape vines had been transferred for years without harm to the environment but, with the invention of a glass box called the Ward Transportation Case in 1835, which kept plants growing on their journey overseas, the parasites feeding on the vines were able to survive the voyage (Campbell 28). Another theory proposes that steam ships made the ocean crossing faster which allowed the aphids to survive the voyage. ‘If [vines] had been infected with aphids, they would have died by the time the long sea voyage was completed. But steamships carried the plants far more quickly and the railway reduced the time of the inland voyage’ (Campbell 108). These vines were rarely used for wine production but they were cultivated in large gardens with nearby vineyards. In this manner, the phylloxera were innocuously introduced to Europe. Due to the life cycle of the phylloxera and their initially slow but exponential spread, the effects of their presence were not observed for several years. The insect was identified as early as 1863 by an entomologist at Oxford named J.O. Westwood after he received samples of the insect from a London suburb (Oxford Companion to Wine), but its effects on native European vines was still unknown. That same year several vineyards in the Rhone region of France were infected but the cause was not apparent until several years later. One of the first documented devastations of vines was written by a French customs inspector, David de Pénanrun, in 1867 who described ‘something wrong with his vines. Leaves were turning brown and falling early. The affliction seemed to spread outwards in a circle’ (Campbell 45). The same year, a veterinarian, Monsieur Delorme, wrote of ‘a small proprietor at Saint-Martin-de-Crau [noticing] leaves on a number of vines turning rapidly from green to red. Within a month ‘most of the vines were already withered and beginning to dry out’’ (Campbell 46). The phylloxera were not immediately identified as the culprit because ‘when roots had been dug up on dead and dying vines in Floirac scarcely any phylloxera were found’ (Campbell 101). Their life cycle and feeding cycles allow them to move to healthy plants as infected plants are dying. 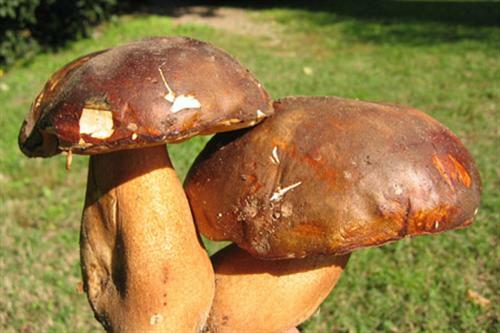 When they were noticed, some speculated that they were a result of the disease, not the cause, and blamed the vine failures on too much rain. Phylloxera reproduce in large quantities during the summer seasons and their winged form allows them to move from plant to plant which resulted in a very rapid spread through Europe. In the years following the first infestations, many surrounding vineyards rotted and the effects sprung up elsewhere in Europe as well, although the main concentration was in France. Despite this discovery, arguments continued to storm over the true cause of the devastation. ‘The greatly respected Henri Marés … declared it was ‘the severe cold that had continued unbroken last winter that is responsible for the deplorable condition of the vines’ (Campbell 51). The following year Planchon, the entomologist Louis Vialla and Jules Lichtenstein were dispatched by the Agricultural Society of France to continue investigation of the aphid; that summer they received correspondence from the State Entomologist of Missouri, Charles Riley. He wrote that the aphids found by Planchon were in fact the same ones that had been studied in the United States, but that they had not had such a disastrous effect on the vines there (Campbell 68). The scientists had found the cause of the devastation and theorized that it came from America, but no cure was yet in sight. The French Commission on the Phylloxera accepted Planchon’s theories and offered a reward of 20,000 francs to whoever could find a cure for the attacks of the aphid (Campbell 80). A French botanist named Léo Laliman who had both American and European vines in his garden reported to the Agricultural Society of France that the American vines had withstood the phylloxera invasion while the European vines had perished (Campbell 71). He proposed a process called ‘grafting’ vineyards ought to fuse the vines of the European vitis vinifera with the roots of the phylloxera-resistant, vitis varieties from America. This process did not combine the genetics of the two plants but rather formed a compound plant; European vines on American roots. Riley, the State Entomologist of Missouri, confirmed that the phylloxera were not fatal to American vines. In her account of the phylloxera infestation Christy Campbell remarks that ‘leaf-galling is not fatal to the vine; nor, on American species, are the root predations. Over millennia of evolution wild vines developed ways to keep the attacker at bay … European vine-roots had and have no such defences’ (Campbell 77). American resistance had been established but few took note of Laliman’s grafting proposal; grafting was not immediately used as many believed that it would reduce the quality of the grapes produced. Many potential remedies were tested to no avail; Riley remarked that ‘all insecticides are useless’ (Campbell 124). It was not until 1876 that Jean-Henri Fabre reported on his vineyards of ‘grafted Aramons on American varieties’; he said that ‘[the grafted vines] produced no alteration in the quality of taste of the wine nor had any influence on the [resistant] constitution of the roots’ (Campbell 154).That same year Planchon advocated the same thing. ‘While the power of the rootstock directly influences the development of the transplant, the rootstock does not transmit the particular taste which it would have in its own grapes’ (Campbell 160). Despite rare successes from experimental vineyards grafted onto American rootstock, many still believed that insecticides would be the cure. As such, the French government briefly implemented a ban on the importation of American vines that would prove only to delay the eventual remedy. Lichtenstein, one of the members of the phylloxera investigation, published statements urging the expanded use of grafts. He wrote that ‘the wines of France will live again, reborn on the resistant rootstocks of America’ (Campbell 195). Campbell describes how ‘slowly, slowly, reconstitution [grafting] took place. When the Beaujolais was officially declared phylloxerated in 1880, the import of alien vines became legal’. According to the French Ministry of Agriculture, about a third of France’s vineyards had been transplanted onto grafted or hybridized vines (Campbell 235). Even into the 1920s there were still un-grafted vineyards surviving on expensive chemical defenses. Today still there are vineyards in Australia, South America, the Middle East and scattered islands that survive on ungrafted vines because of soil conditions or strict controls preventing the movement of phylloxera. But, as noted before, it is estimated that 85% of the world’s vineyards are planted on grafted rootstocks (Oxford Companion to Wine). Although the effects of the phylloxera crisis were felt the most in France, it affected much of Western Europe. Professor Battista Grassi estimated that only about 10% of the country’s vines were infected by 1912; ‘the reason for its slow spread was the comparatively isolated nature of Italian vineyards and the habit of growing many vines through trees’ (Ordish 172). The first report of phylloxera in Italy was near Lake Como, but the regions struck hardest were Sicily and Calabria. In a New York Times article published November 8th, 1895 the Italian Consul estimated that lost wages in Sicily in the early 1890s totaled over thirty million dollars (‘Phylloxera Ravages Italy’). Many vineyard owners actually saw the infestation in France as an economic opportunity to export their own wines. In fact, in 1909 five million hectoliters of Italian wine exports to France made up about 10% of the wine consumed by the French (Campbell 249). As the infestation struck Italy later on and much more slowly, its eradication was much more easily addressed in Italy than in France. Italy, along with many other European countries, enacted a temporary ban on plants that might carry the phylloxera into their vineyards. Vineyards found infected early on were burned at the expense of the state in order to slow the spread (Ordish 173). Although the burning of infected vineyards benefited the Italian wine industry as a whole, there were negative reactions from the owners and workers; in August of 1893 the New York Times reported that ‘the Minister of Agriculture … recently ordered the destruction of vineyards covering a large area in the Province of Novara. The peasants, losing employment through these steps, began to riot. Many were injured in conflicts with the police, and a large number were arrested’ (‘Italian Peasants Rioting’). Once grafting was accepted as a solution the ban on imported vines was lifted in order to supply Italian vineyards with resistant rootstocks subsidized by the government. In fact, another New York Times article published February 2, 1892 indicates that ‘the Italian Minister of Agriculture has for a number of years distributed large quantities of American grape vines among the farmers’ and that ‘from the island of Sicily alone the Minister has received demands for twenty six million rootstocks’ (‘American Vines in Italy’). The government supplied American cuttings and seeds, along with subsidies to farmers planting New World vines (Ordish 173). The Turin Phylloxera Council published their notes from an 1880 meeting, remarking that ‘we, knowing the danger, shall be able in great part to avoid it … Italy having to fight against Phylloxera finds herself in a more favourable position, being abundantly supplied with American vines, which are known to resist the disease’ (Jemina 3). As a result of the later introduction, slower spread and governmental subsidies, Italy’s vineyards were damaged far less than those of France. ‘AMERICAN VINES IN ITALY’ Editorial. New York Times 2 Feb. 1892. The New York Times. Web. 06 Dec. 2010. <http://query.nytimes.com/mem/archive-free/pdf?res=FB0D15FC355D15738DDDAB0894DA405B8285F0D3&gt;. Campbell, Christy. Phylloxera: How Wine Was Saved for the World. London: HarperCollins, 2004. Print. ‘Italian Peasants Rioting’ Editorial. New York Times 4 Aug. 1893. The New York Times. Web. 06 Dec. 2010. <http://query.nytimes.com/mem/archive-free/pdf?res=F50D13F93F5A1A738DDDAD0894D0405B8385F0D3&gt;. Italy. The Turin Phylloxera Council. The Turin Phylloxera Council: Ideas as to the Phylloxera and Rules for Watching the Vineyards. By Jemina. Turin, 1887. John Rylands University Library. Web. 7 Dec. 2010. <http://www.jstor.org/stable/60231304&gt;. Ordish, George. The Great Wine Blight. London: Sidgwick & Jackson, 1987. Print. ‘PHYLLOXERA RAVAGES ITALY’ Editorial. New York Times 08 Nov. 1895. The New York Times. Web. 06 Dec. 2010. <http://query.nytimes.com/mem/archive-free/pdf?res=FB0A15FE355911738DDDA10894D9415B8585F0D3&gt;. Robinson, Jancis. The Oxford Companion to Wine. Oxford: Oxford UP, 1999.